Based on the experiences of over 175 organizations, this report will explore how Best-in-Class companies simplify their audit and inspection process to reduce repeat mistakes and drive down overall risk. 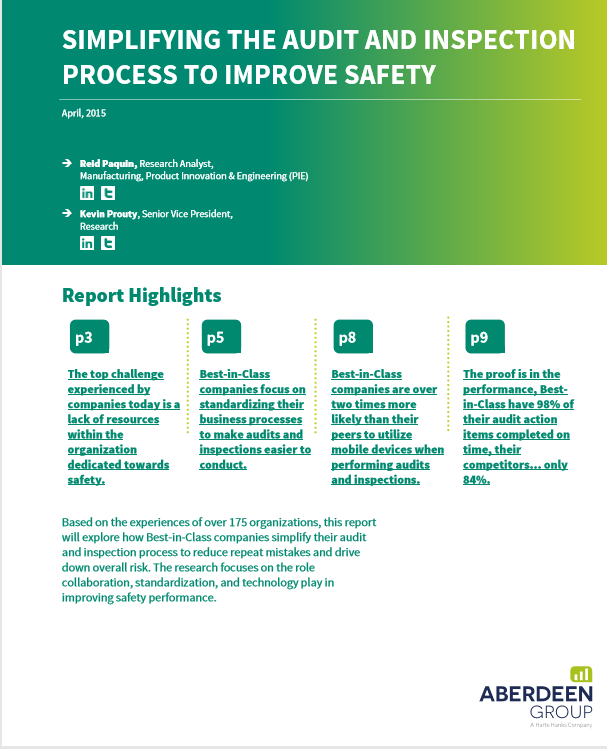 The research focuses on the role collaboration, standardization, and technology play in improving safety performance. Investments in safety are more than just cost avoidance measures. Today, safety must be considered vital not only to the health of your employees, but also to the health of the business. Companies that are not working to eliminate incidents and comply with safety mandates are introducing large amounts of risk into their organization. This realization by Best-in-Class companies has driven a rethinking in the way they approach safety audits & inspections.